Looks good and makes me hungy! Great idea to do it with rye sour dough. Sieht wunderbar aus und schmeckt bestimmt auch so! So sieht mein Brot oben IMMER aus…. leider. Manchmal hätt ichs lieber glatt. 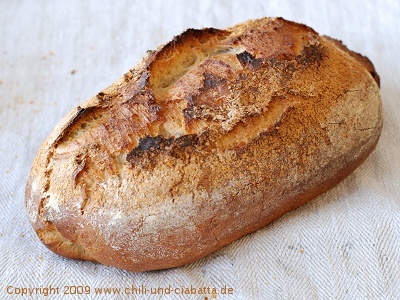 Petra, you always bake the most wonderful loaves, and this one is no exception!! Totally fell in love with that crust, looks amazing!! Thanks so much for participating this BBD! Sehr schönes Brot und auch die Links am Ende des Beitrages finde ich super! Das sieht super aus! Die Kruste sieht fantastisch aus! I enjoy your blog, & I will give the bread a go this weekend, in my bread maker though as not a lot of strength in wrists. I love the idea of putting it in the microwave with the light on…just perfect! Sieht toll knusprig aus mit den aufgesprungenen Ecken der Krust. Ein ideales Sandwichbrot, stelle ich mir vor. Sieht zum Reinbeissen aus, kommt auf meine ellenlange Nachbackliste! Tut mir leid, habe ganz vergessen, dir zu antworten! Das Brot ist ja oben eingeschnitten, das soll so aufreißen. Wenn du es glatt möchtest, musst du es fast bis zur Vollgare gehen lassen und dann einschießen, damit es keinen großen Ofentrieb mehr hat. Das macht aber nicht bei jedem Brottyp Sinn. What a beautiful loaf of bread. I’m glad I found you on Bread Baking Day. I will be back! That crust is to die for! It looks so good! Loved the idea of rye chops! Looks and sound great. love your blog. Petra your potato bread is a marvel, gorgeous crust and crumb! 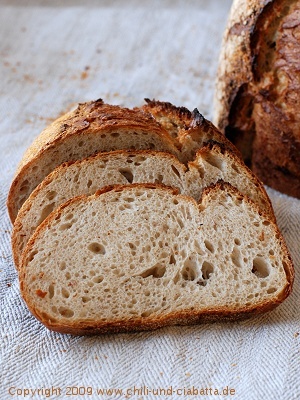 The sourdough, the rye and the potato, those are among my favorite things in bread. This is truly a must make bread. Tough cookies those recipes for 20 loaves 😉 Love your microwave light trick. It’s a combination of all of my favorite flavors- a must try!